“Coulson lives!” was the excited cry from many Marvel movie fans when they learned that Agent Phil Coulson would be resurrected for the TV show Agents of SHIELD. 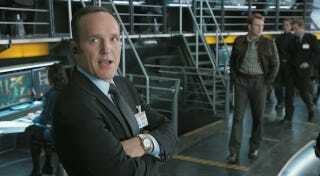 But not everyone was a fan of bringing Coulson back, including director Joss Whedon, who felt it took “some of the punch out of” his Avengers movie. Mental Floss has an interview with Joss Whedon that covers a number of topics: his desire to go back to working on his own original projects, working within Marvel’s policies for movies, and how little time he has for consuming pop culture. Whedon (who is one of the creators and executive producers of Agents of SHIELD) is entitled to his own ideas about the canon (within Marvel’s strictures), but I think he’s going to have a hard time convincing fans that the MCU movies and TV shows don’t share the same continuity. But we can certainly understand how he feels that one of his movie’s big moments was a little cheated in the end.